On August 1st and 2nd 6:00PM-8:00PM there will be uniform fittings at the Bliss Field House. This year we have a new uniform vender, WeGotSoccer. The Club Uniform Kit is comprised of two Adidas Jerseys (1- Green and 1 - Yellow), pair of shorts (black), and two pairs of socks (black). The cost of the new uniform kit is $85.50. Below is the link to the online store to order the uniform kit. When ordering at the checkout make sure that you enter in the Promotion Code of DRSTRIKERREWARD in order to get the above pricing. Any teams that are playing the Fall SCSL Season can complete their Player Registration at the Uniform Fittings also. All even year teams (U10, U12, and U14) will need a new photo for their player pass card. Any new players will also need to bring a copy of their birth certificate. This spring will see the return of our Dighton Rehoboth Soccer Club U6-U7 Player Development Program. The U6-U7 Youth Soccer Program is designed to develop fundamental soccer skills for all recreational players and to help transition players from recreational level to competitive travel soccer. May 24th). A T-shirt will be provided after registration. The cost of the program is $50. If your child is unsure about joining, come to the first week’s practice and give it a try. Players should be in kindergarten or 1st grade. 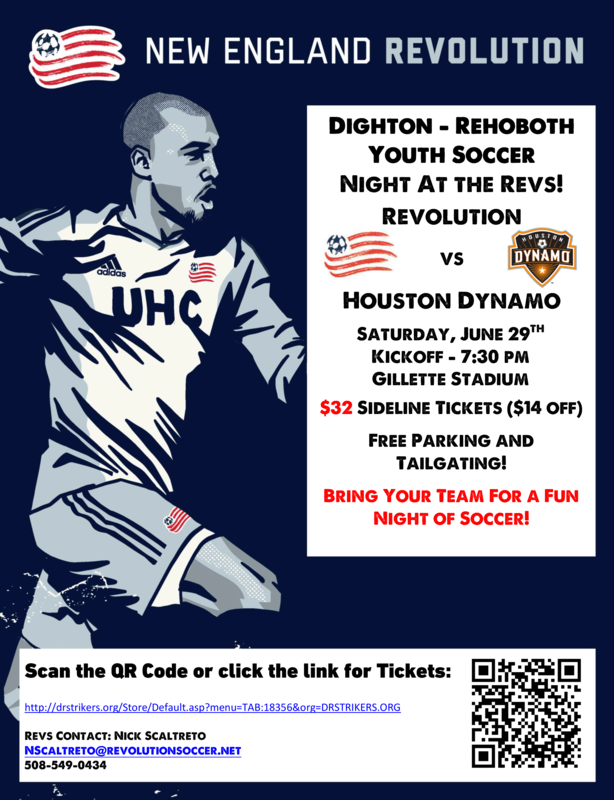 The DRSC is affiliated with Massachusetts Youth Soccer Association, Dighton Youth Soccer League and Rehoboth Youth Soccer Club. The DRSC is responsible for competitive soccer for the two towns. The Club participates within the South Coast Soccer League (SCSL). The SCSL is comprised of the towns within southeast Massachusetts, this includes Cape Cod, Martha's Vineyard, and Nantucket. DRSC Teams will travel throughout the season to the towns within the SCSL this includes Cape Cod, Martha’s Vineyard, and Nantucket. When traveling to Martha’s Vineyard and Nantucket the DRSC will cover the travel costs for the players and coaches of the team that is traveling. Parents and spectators will receive a discounted ferry rate when traveling with the team to the Islands. SCSL Spring Season runs from April to June. Game days vary depending on the Age Group and Division that the team is playing in. The breakdown of game days is below. Game times vary throughout the day from 8:00AM until 6:30PM. Coaches do have flexibility to request game day/time changes. SCSL Fall Season runs September to November. The Fall Season is not mandatory for teams/players to participate in. The Fall Season is not covered by the Player Registration Fee, the registration fee for the Fall Season is $60.00 per player. The Fall Season starts at Age Group Grade 3 (U9). All games for the Fall Season are played on Saturdays. Training/Practices will be held at Bliss Soccer Complex in Rehoboth in the Spring and Sherwood Ultra Sports in Seekonk during the winter. Teams will train at least once a week. Teams may opt to train more than once. Training will run December through June. All DRSC coaches are volunteers. The coaches put in a lot of time and effort for your child to enjoy the game of soccer. The DRSC is always looking for volunteers to coach. We require all coaches to obtain a minimum of a US Soccer F License (the DRSC will reimburse the license fee). The coaches are expected to make every effort to make training and games. To help aid the coaches the DRSC board can help provide guidance with training plans and game day situations. The DRSC holds tryouts in September. After the tryout process teams are formed with the coaches and the DRCS Board. All teams need to be approved by the DRSC Board. The players will tryout using a “dual grade/age” group; Grades 1/2, Grades 3/4, Grades 5/6, Grades 7/8. By utilizing the “dual grade/age” groups the DRSC will be able to field teams in the appropriate Divisions according to the skill/experience of the players on the roster. 1. Highest Skilled/Experienced Players - The combination of ages will allow (at least every other year) for kids who are at the highest level of experience/skill to benefit from the additional challenge of playing with/against "like" skilled players one age division higher. Being able to create an even skilled team with a combination different aged players will benefit game play, practice planning and team/player development across the board. 2. Mid-Level Skilled/Experienced Players - In their current age group or one higher, these players will be able to play with "like" skilled players which will greatly improve the ability for the "team" to act as a "team". Easier to manage player substitutions and in most cases allow players to play in a division more appropriate for their skill/experience level. 3. Lower Skilled/Experienced Players - The advantages for this group mirror many of those for the second group, however these advantages are even more pronounced. Depending on the age group and team numbers, many of these players have been playing on D1 teams and in some cases (historically) may have even been placed on an upper age division D1 teams putting them in a very counterproductive scenario for their development. The even age groups will allow them in most cases to play on a more appropriate team/division which will greatly benefit practice and game play/playtime for the team as a whole. After all teams have been formed the DRSC will hold a Club Registration Night. At this event the players will meet their team’s coach, try one uniforms, take player pass photo, and submit any paperwork to finish their registration. The registration fee must be paid on or before Registration Night. By registering and attending this event the player has committed to his/her team. After this event if a player drops off of a team the DRSC will not be able to refund the registration fee. Once Registration Night is completed the Club has a strict timeline to get Rosters and Pass Cards to the SCSL, and payment for each player and team. These expenses are funded by the players registration cost. Players are expected to make every effort to attend the weekly training and games. The DRSC fully understands that there are conflicts throughout the year. These conflicts need to be addressed with the team’s coach. 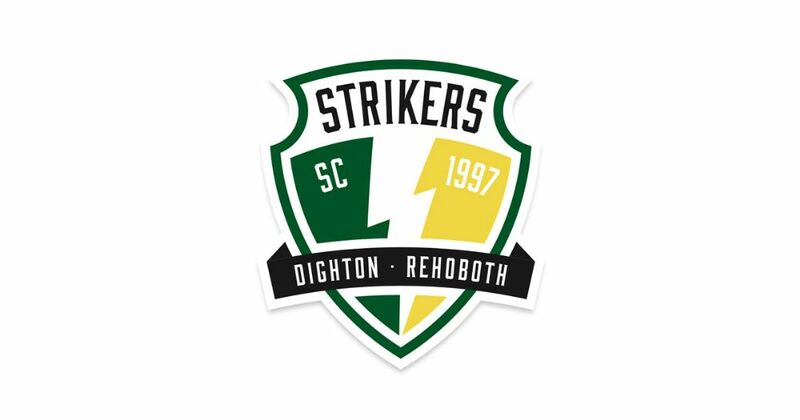 The Dighton Rehoboth Strikers Soccer Club was founded in 1997. With more than two decades of history, the board felt it was time to update and modernize the logo as the club continues to expand and evolve. The new logo was an exciting project and a true a collaboration between the board members. The project was spearheaded by the club’s president, Matt Chartier, who designed the initial logo concepts. The board then worked through several rounds of feedback and created multiple versions of each concept. When the board’s favorite concepts were agreed upon, the logos were refined, polished and finalized by the award-winning design team at Brunello Inc, a Boston-based digital agency owned by board member Adam Hoyle. You’ll start seeing the new logo rolled out across the club throughout 2018. We hope you like it! Concussions are a serious health concern in youth sports. The DRSC is committed to the physical and emotional safety of our players. In order to focus on this commitment we are educating our coaches, parents and Board Members in the dangers of concussion-related injuries. The DRSC will provide our members with tools and recourses to educate them on the extreme dangers of concussions; how to prepare for and protect against concussions; the causes and recognizing the symptoms of a concussive injury. It is also recommended that parents take this free online course so they know and understand the severity, the symptoms, and recovery information of concussion-related injuries.